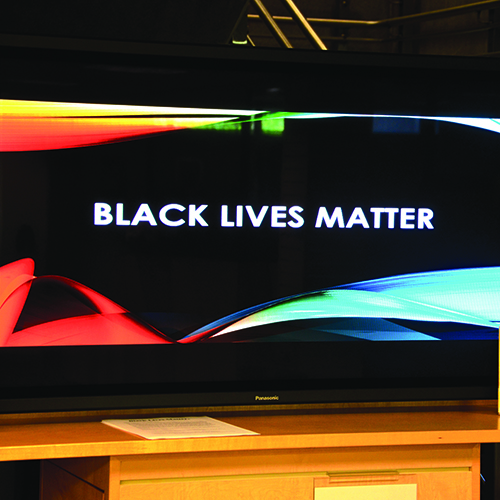 Over the month of July, the Bellevue College Library and Media Center is showing a “Black Lives Matter” PowerPoint presentation in the lobby. The purpose of this is to honor the lives lost in the South Carolina Church massacre as well as other events of racial discrimination in recent years. BlackLivesMatter.com is an expanding website intended to bring notice to the unjustified police brutality towards people of color. The website highlights multiple members of the black community who died due to police brutality. The website also details different demands by the African American community, which include housing and access to more affordable food. In addition, the website lists and explains goals the movement hopes to accomplish such as an end to all forms of discrimination, full employment for the African American community, an end to the prison industrial complex and more. The motivation for the PowerPoint at Bellevue College originated from a suggestion given by Larry Boykin, the Media Technician Senior at the BC Library Media Center. According to Boykin, the LMC got a request from the new dean Vivienne McClendon to do something that was socially motivated, and the “Black Lives Matter” display was one of the suggestions. “Me, along with Becky Turnbull, our librarian, volunteered and we decided to step up to the plate and make this display,” said Boykin. Through this display, Boykin explained how the LMC staff is able to help the students learn more about current events. On top of that, he wanted students to know that such incidents are not new news. “They’ve been going on for decades. They can look up information and realize that this has been a struggle the African American community has been going through for quite a while,” said Boykin. He also invites students to go to the reference librarian for help in finding more videos of some of the issues present in the African American community. Currently, the display is situated in the lobby near the entrance of the library.